The Incident Handling & Response Professional (IHRP) training course is now open for enrollment. Discover it in details and claim your special launch offer! 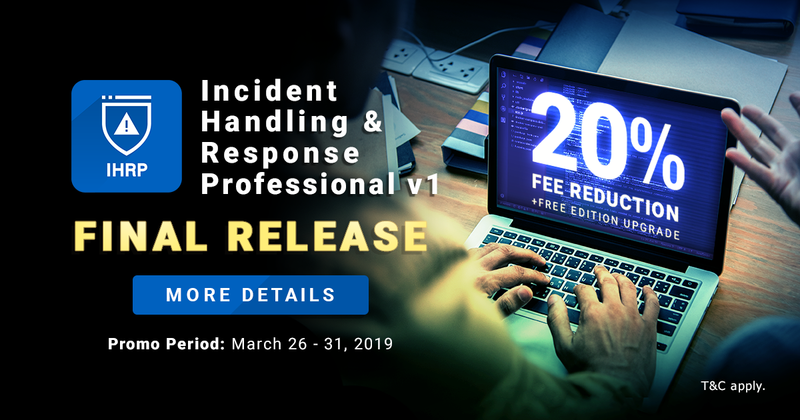 The Incident Handling & Response Professional training course – IHRP – is the most comprehensive and practical online course on Incident Handling & Response. It takes you all the way from the basics to a professional level, where you will be able to effectively analyze, handle, and respond to security incidents. Want to know more? Discover the detailed syllabus here. The IHRP course is a practice-based curriculum. By enrolling in this training course, you’ll get lifetime access to an extensive number of practical labs, which offer an unmatched practical learning experience. All of the labs provide a fully isolated, per-student access to real-life scenarios, specially created to better prepare you for your next position. Learn more about the various labs available in this training here. At the end of the IHRP training course, you’ll get a chance to test your knowledge by taking the eCIRv1 (eLearnSecurity Certified Incident Responder) certification exam. Instead of putting you through a series of multiple-choice questions, you are expected to perform actual incident response activities inside a corporate network. This incident response test is modeled after real-world scenarios and cutting-edge attacks. Passing this highly practical exam proves your practical skills to both yourself and your (potential) employer! Read more about this certification exam here. Get An Exclusive Launch Offer! Are you an SOC Analysts? CSIRT Member? Incident Handlers? Incident Responders? Or simply a Red Team member who want to understand blue team tactics and deliver stealthier penetration tests? The IHRP training course can not only help you learn up-to-date prevention and defensive security techniques, but also open your career to whole new opportunities. Interested in this training course? To celebrate the launch of the new IHRP training course, we’re offering you 20% off your course fees and a free upgrade to the higher Edition! 🎊 What does this mean? It means you can enroll in the Barebone or Full Edition and get access to the Full or Elite Edition (respectively!) at no additional cost! 🎉 Make sure to use the coupon code “IHR-D4A” at the time of enrollment. *This offer is only valid until March 31. .ENROLL NOW. | .GET FREE TRIAL.